I am hoping soon to start work on the final draft of a book whose working title has been Cognitive Design. This book is about the design and standardization of sets of things – such as the letters of the alphabet, the fifty United States, the notes in the musical octave, the different grades you can give your students, or the stops on a subway line. Every person deals with one or another of these sets of things on a daily basis, and for many people they hold a sort of fascination. We sometimes forget that societies, cultures, and the human beings within them – not nature – designed these sets, chose labels for their members, and made them into standards. Many people have a sense that these different sets have something in common – but most would be hard-pressed to say what that is. My book lays out the answer. I submitted the most recent draft of it as my Ph.D. dissertation at Rutgers University in April 2005. 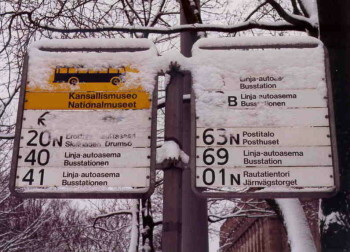 The book mixes linguistic and sociological analysis with practical design advice for those charged with creating both sets of things, and labels for them (such as the numbers for the bus routes shown in the photograph). There are approximately sixty illustrations. The book is divided into six chapters, plus a prologue and a conclusion. The first three chapters deal with set design – creating the look and feel of a set of things. The last three chapters deal with planning the status of a set – popularizing, standardizing, legitimizing, and socializing people to it. I have written the book in plain language so that it will be accessible to those without an academic background in linguistics, design, or the social sciences, while still rewarding for experts. Everything is ready to go for the final revision of the book, but I am waiting to dig into my pile of revision notes until I find someone interested in publishing it. I have sent it out to several university presses and have received polite and kind rejections. My dissertation committee loved the manuscript and tells me I should send it out to many more, and I keep promising myself that I will find time to, but academic monograph publication is less and less viable and it may make better sense to publish the manuscript online. The previous (third) draft totalled about 145,000 words (110,000 in the text, 20,000 in footnotes and 15,000 in the bibliography and appendix). In revising, I'd like to prune the manuscript by 15-20% without reducing its overall quality. I would also like to come up with a better title. Cognitive Design, which was my advisor's favorite, is catchy, but dishonest, as the book deals with only one type of cognitive design. Two more honest, but less exciting titles would be Contrast Set Design or The Design of Artificial Object Sets. In the meantime, please feel free to download the 2005 version of the book (PDF, 3 MB) or to read the summary below. Anthropologist Harold Conklin was the first person to use the word "contrast set" to describe everyday sets of things, like the seven days of the week, where each unit is an equivalent member of the same class. Many of these sets are "seen but unnoticed" phenomena. We think of them as trivial, yet we make use of them over and over again through the course of a day, and many people are shyly curious about their origin and proper use. My book brings them into the spotlight, using proven techniques for analyzing the unspoken rules of society whose heritage runs through Eviatar Zerubavel and Erving Goffman to Georg Simmel. Before proceeding further, I review the philosophical distinction between natural kinds and artificial kinds, applying it to contrast sets, whose divisions may be relatively natural (like the eight Hawaiian islands) or relatively artificial (like the fifty United States). I also discuss the similarities and differences between contrast sets and sets of words. This chapter introduces the concept of the contrast set in more detail, and gives lots of examples (such as the different keys in the piano octave in the illustration). I focus on the design process of creating contrast sets from scratch. Creating contrast sets means dividing instances of a type into classes: this spot will be Nevada and that spot Oregon; this frequency we will call A and that frequency A flat; this level of performance earns a B and that a B+; land at this level of altitude will be shown as dark green on the map and at that one light brown; today belongs to January and tomorrow to February. This partitioning process defines artificial objects and categories by marking their boundaries (edges) or focal points (centers). I use the term domain to label the "field" within which a contrast set is created. Domains vary in the degree to which they suggest a partitioning strategy to the contrast set designer, and partitioning choice is more art than science. At the end of the chapter I consider more advanced issues, including precision, "interactive" kinds, coordinated partitions across multiple sets, and the visual representation of the members of a contrast set. Labeling means tagging the members of a contrast set so that they can be identified and discussed. Labeling is ubiquitous in society, whether it involves house numbers, street names, seat numbers, dog collars, license plates, or ways to identify the lines of a subway system. Numerals, letters of the alphabet, and colors (such as those which tag the keys in the photograph) are the most common, but not the only labeling tools. There is an entire art to the creation and display of labels. "Nametag" labels (such as house numbers) appear on, or in close proximity to, their referent. Special labels may (like the name John Doe) take on the role of generically referring to "any member of the contrast set." Since the same labeling material gets reused to identify members of many contrast sets, one must often also make sure the context in which the label is being used is made clear. Labeling sometimes obscures the differences between the members of a contrast set, reduces their sense of individuality, and turns them into "just a number." Labeling tends to be taken for granted in daily life, and those who foreground the labeling process are often stigmatized as unempathetic, nerdy, or even autistic. I use the term "mapping" to refer to a principled relationship between a contrast set and its label set. In a principled relationship, it is possible to predict which label goes with a given contrast set member, and vice versa. To take a simple example, in New York City, the higher the street number, the further north the street. I discuss the pros and cons, from a practical design perspective, of using a mapping principle to label a contrast set. Mapping requires that both contrast sets and label sets have congruent topologies (ways of projecting the members of a set into space). Depending on the set topology, there are several different types of mapping (illustrated schematically at right). Many set topologies are standardized, such as alphabetical order and keyboard layout, and I give an overview of this standardization process. Some people also develop durable private labeling and mapping strategies for a set, which they do not share with anyone else. I end the chapter with a brief case study of the problem of table labeling in the revolving restaurant in Sky Tower, Auckland, New Zealand. Contrast sets, label sets, and mappings between them are "social facts" which become standardized throughout an entire culture or society. 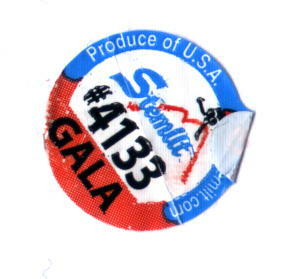 For example, the apple label in the image at right shows how an apple grower and a supermarket chain expect each other to agree on the meaning of the label "4133." The social and geographical boundaries of these shared understandings mark out what Ludwik Fleck first termed "thought communities." Communities commit to the use of a contrast set both physically (for example, by printing labels and sticking them on apples) and cognitively (for example, by encouraging checkout clerks to learn produce codes by heart). Using one particular contrast set (and not another) helps confer a sense of identity on the community which uses it, and a particular writing system, coinage standard, typewriter keyboard layout, library classification system, or other standardized contrast set can easily serve as a symbol of an entire social group. Human beings commonly imagine that the social facts and conventions they encounter every day, like the alphabet or the seven�day week, are facts of the natural world. Sociologists use the word "reification" to refer to this kind of mistaken belief. Contrast sets are especially common objects of reification. Indeed, we regularly create myth-like "justifications" for them. These justifications invoke history, nature, the supernatural, or a group's separateness or affiliation with another group to claim that a particular contrast set is the best or the natural way to do things. Justifications legitimize the institution of a contrast set within a given thought community. Because justifications are powerful, and because we tend to forget that conventions are subject to human authorship, it is very difficult to dictate change in standardized contrast sets, just as it is very difficult to enforce change in other social institutions. The "standards evangelists" who press us to rethink our alphabets, time reckoning systems, and other fundamental contrast sets often design aesthetically pleasing alternatives, but neglect to think about the practical problem of enforcing them on an entire social group. Nevertheless, change does happen, sometimes in an emergent fashion, but sometimes through deliberate planning (the illustration shows the cover of a booklet designed to familiarize the public with a new telephone numbering plan). People are not born with a command of conventional contrast sets; they must learn about them. The environment we create in an elementary school classroom is full of letters, numerals, clocks, calendars, and maps which help children identify the members of our most fundamental contrast sets. Especially as we grow older and learn to master the more complex contrast sets used in transport schedules, library shelving, university course labeling, or musical notation, we find that we cannot keep all the facts about these contrast sets in our head. Bus schedules, library signage, or a printed university course catalog allow users to pull knowledge into their minds from the external world, hopefully just at the point when they need it. When we travel, we venture beyond the safety and familiarity of our own cognitive "neighborhood," and we encounter unfamiliar contrast sets (which locals command but we do not). There are many ways of resocializing ourselves to these alien norms. One of the most common is a travel guidebook. The illustration shows a Japanese guidebook's instructions for dialing home from America, with the taxonomy of country code, city code, and local number clearly spelled out. Scholars of individual contrast sets too rarely see their subject material as part of a larger pattern. For example, scholars of pitch standardization, clothing sizing, student grading, and linguistic euphemism have all noticed inflationary patterns within the contrast sets they study, but have ignored the identical patterns in unrelated fields. Scholars of writing systems have explained very convincingly why repeated attempts to retire the Chinese character system have failed, but never relate the difficulty of change in writing systems to the difficulty of changing, say, from standard to metric units in the United States. Similarly, scholars who have pointed out the artificiality of American racial classification systems have rarely referred to parallel issues in library classification or geographical boundaries. This book tries to lay out the theory and terminology to place all these stories in a common frame. Contrast set design is one way in which conscious planning influences our cognitive and mental lives. We usually think of design as producing buildings, furniture, consumer goods or graphic images. When we design contrast sets, we create cognitive objects, which may, when we choose to physically express them, reside in the external world as well. I think here of anthropologist Willett Kempton. At the end of an article on Americans' folk understanding of their home thermostats, he observed that his topic might seem insignificant, but only until one considers the tens of billions of dollars spent on home heating every year. Contrast sets may also seem trivial, but it is also their very ubiquity in everyday life which makes thinking about them at length so important.